Hi, my name is Lance and I have something I need to share. I've only told this story to a hand-full of people (5 or less), but I wanted to share with you; the hurt, the broken, the alone, the damaged - my "comrades with cracks"... my frien...ds. One Sunday morning during worship (about 4 years ago), I stood with my eyes tightly closed. The moving and the emotion of the moment focused my attention on Father and I found myself so broken, so hurting, so alone and UNWORTHY. I was only a few months into my separation from the "love of my life" of 12 years and I felt as if I had no one. I felt so hurt, so rejected, so broken. I was lost in a world of happy couples and myself a loner. But at the point I couldn't imagine anything positive coming of my brokenness or anything good coming of my loneliness, my closed eyes were FLOODED with the brightest of lights. As they adjusted, I saw the silhouette of a vase, a clay pot. It was standing, it was however full of cracks, breaks, missing pieces. It was imperfect, like me. The light was coming from within and pouring out of the imperfections that were so numerous. So, my mind wonders at that time, what's the meaning of this vision (the first I'd ever experienced and I can say that I never have again)? Truly, at this point in my valley, I was so longing for Father's presence that I feel He sent me my own personal "burning bush" to speak to me. "My boy, this pot is broken, like you. It's imperfect, like you. It's simply a vessel, like you." But what good is a vessel to carry ANYTHING if it's shattered and alone? "As I pour into you, son, my broken vessel, I know you are broken. I know you are cracked. I know this because I've seen the cause and the reason for each fracture, each break. But I've stood by you. I've seen my wonderful creation, fastened by these two potter's hands, become so fragile, so hurt, so damaged. Why don't you stop them from damaging me? "I have and I am and I will, son. I have protected you and I've repaired you. All along, I'm here. You've asked for help and I've provided it. You've asked for healing and I've assisted. You are more strong with me than you could have ever been without me. Too, son, you aren't innocent. Many of these cracks, holes, and breaks are at your own doing. You have caused as much damage here as others have offered to you. You have brought hurt upon yourself as well." Then why don't you crush this worthless vessel and let it rest in you? "Your journey is not over. I have a lot of work for you ahead. I have knowledge of things, people, and places that you've yet to see. I have your future laid out in front of me and it is bright. It is a story worth living. It's not over for this vessel." So, can't you fix all these cracks and make me a perfect vessel - better able to do your work? "No, son, you're missing the point. As I pour into you, I don't need a vessel to hold my love, to hold my passion, to hold my wants and desires for this blessed life you live. I don't want you to take my blessings and hoard them away. I don't need you to hold your tongue and never speak of the amazing life you are living and the love we share. Son, I need you to bless others. As I pour into you, your hurts, your stories, your history of the life's events you've seen and been through, there have left cracks through which you can pass along and spew out my blessings to others. You can share my love. You can share my hope. You can share my grace and passion with those around you. There's no need to be alone. There's no good coming from it. Your hurt is a hurt that isn't yours alone. Others share it. Others need to know that THEY are NOT ALONE. You all hurt, you all need to share. Allow your brokenness to be your conduit for passing along a love that never ends, never fades, and grows stronger the closer you get to the source. As people draw near to you and you draw near to me, you will bless them by simply being you - in all your "imperfection". Much like the beauty of an emerald, you are perfectly imperfect - inclusions and all." Thank you, Father. Thank you for a blessed and broken life. Thank you for my perfect imperfection. Thank you for being THE LOVE of my life! From that day, I gained a new focus. I looked at things differently. I was still hurt, but knew that my hurt had a purpose. I knew I was blessed to be broken and able to share my brokenness with others. Tonight, I was reminded of how I saw this vision, as I found myself, again, broken and confused. It's funny how soon and easily we end up in the same place or even a different place and yet, we forget the PEACE we can so easily find in spite of such a broken feeling - through the love of Father. Be blessed in your brokenness, be shining His glory for all to see. As I thought about this vision, tonight, I decided to google "broken vessel" and look at this AMAZING image I found. Wow. Thank you, Nancy Cupp, for putting my vision (and yours) into a tangible image for others to share! Lance contacted me to share his amazing story. I was so touched and wanted to share his story with you. He's a young man from South Carolina. I hope his story blesses you as much as it did me. I painted THE BROKEN VESSEL from a vision I had as well in 2007, when everything seemed to be going wrong and I felt so utterly useless. It was a cold snowy day with predictions of a blizzard coming. I was getting ready to drive to a little town past Detroit to play my harp for a small church north of Detroit. We are from Ohio. The thought of driving in a blizzard was looming over me. My sister called to warn me not to go. I tried calling the people who invited me to come, and they didn't answer their phone for 2-3 hours. I didn't know whether to go or not. We should have left around noon, but now it was almost 3 and the people finally called back and said they were still expecting us. We would barely make it in time, if we left, but, we decided to try. The pressure of being late, having to load up the car, and the coming blizzard put us on edge. As we drove away from the house, we began to argue and my husband got so mad that he turned around and went back home and told me to drive by myself. I'm thinking to myself, how am I going to drive in a blizzard, look at maps, and get through Detroit by myself, BUT I went. After calming down, he called and apologized and said to come back and get him. THANK GOD! There is no way I would have made it through that Detroit traffic with the snow beating against the window, let alone look at maps, and exits, traffic, etc. After we had been on the road for a while, I closed my eyes and said a little prayer. "Father, I am a mess. I'm not prepared for this ministry to play my harp for this church. Father they are expecting a touch from you, and I have nothing to give them. I haven't practiced. I had a fight. I'm late. I don't know what I'm doing. But YOU, LORD, are my only hope and I ask you to use me as a vessel for your glory, even though I am a broken vessel at that". Immediately I saw this brown, ugly vase full of holes and cracks, but, the light shining inside was so bright, that I could barely see the vessel at all. We made it fine to our destination and I did okay on the harp that night. The lady, who invited me, spoke that night. Only about 20 people came, mostly from a van load of people from a half way house. They had just gotten out of prison and were trying to get their lives back together. Most of them came up for prayer afterwards. The next day a man called the lady who invited me and said that God healed him that night. God healed him. Not me. I'm just a broken vessel. Jesus is the light. What others are saying about "The Broken Vessel"
Nancy:- GUESS WHAT…..THE PICTURES JUST ARRIVED IN THE MAIL. I am thrilled with them, you did a marvelous work with this……you have no idea how you can minister to people through this painting. Thank you so much…they arrived in perfect condition! You have got to really give this painting as much exposure as possible, it is very special. I believe there is a definite message in this and people need to know that God loves them and will work with us despite our shortcomings. After all He knows our hearts and He knows we blow it even though it may be unintentional. And He knows that we often listen to the negative messages that the enemy sends our way. I am praying for the Lord to place names on my heart for those that should have this print. Thanks again and thanks for your obedience in painting what you saw in the vision. 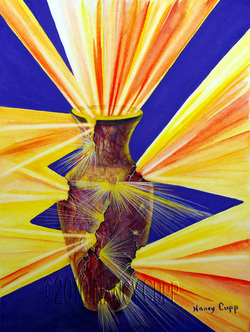 I like the idea of the story that God uses a broken vessel to shine through. The very places that are broken, shine the most light. Like after he does His work in us, we have a story to share of what He did for us. Yes, it's beautiful because it offers hope. That is such a touching story, wonderful picture to illustrate the point. I love the light coming out from the breaks in the vase/vessel. Wow, We are those broken but lit from the inside with the H.S. vessels for His glory. Very good to see and read the story. How wonderful that he takes the broken parts of us and shines through them! The very things we think mar us as vessels, He uses to shine through us. Just brings tears to my eyes.